I waited all week to go out and take a few photos of my beloved city. The entire week has mostly been sunny, and I assumed that the good weather would continue. Unfortunately, yesterday was cloudy and grey, and this morning it was raining. This morning, I walked around town through the crowded piazze and strade (streets). I didn’t want to go to the Duomo for Florence’s famous scoppio del carro (explosion of the cart) because I’ve already seen it a few times, and I’m not fond of the crowds. I thought I could take some photos before the strade filled up, but unfortunately I didn’t get out of the house in time. I made my way through the crowds in Piazza della Signoria with just my macchina fotografica (camera). I then walked down via Cavour, and was still hoping to get to the Duomo. I bumped into a friend on via del Corso and chatted a bit. I saw the carro (cart) at the end of the strada, but by the time I finished talking to my friend, it was gone. 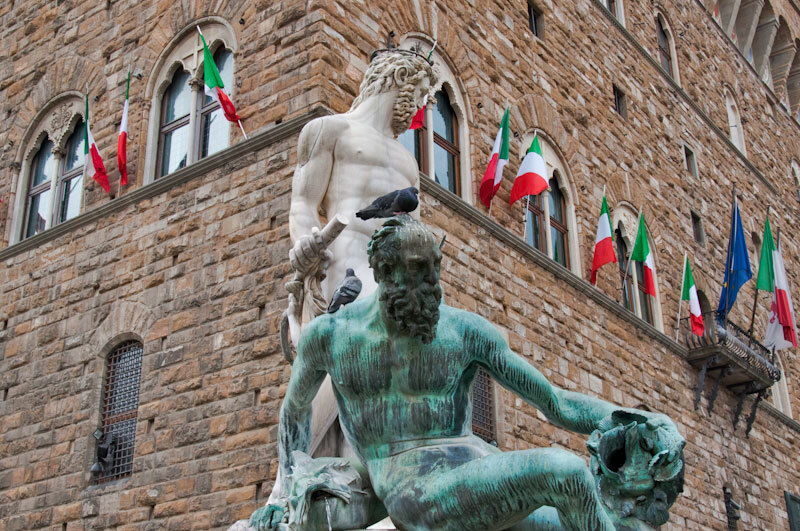 Instead of going to the Duomo, I headed back to Piazza della Signoria. I thought I’d go to the Arno to take some photos, but saw the Fountain of Neptune and was inspired to take a photo of it. People were taking photos in front of it, but I approached the railing and took a few shots of just the monument and the Palazzo Vecchio in the background. I liked the Italian flags still lined up from the celebrations last month. I didn’t have much time before I was to leave for my Easter lunch, so I ran to the Ponte alle Grazie to take a few photos. Unfortunately, I didn’t take the photo I wanted to that I saw during my morning run. Late this afternoon, the sun finally did make it out and lit up the city. I was happy to see its arrival, but I was too tired to go back out to take foto. Hopefully some time this week, I’ll make it out again to take a few foto of my beloved city. I enjoy being inspired by different views of the city. For me, it’s like I’m falling in love again with Florence.